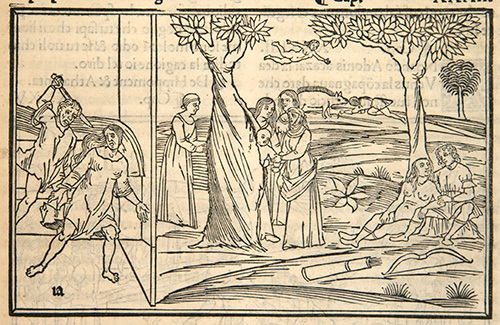 The depth and focus of the Aldine Collection are complemented by the breadth and comprehensiveness of the Ahmanson-Murphy Collection of Early Italian Printing (1465-1600), which encompasses the work of all printers working in Italy, beginning in the early years of printing through 1600, not only printers from Venice, but those from many other Italian cities as well, including Rome, Ferrara, Milan, Parma, Padua, even Palermo. Within this wide-ranging collection of some 5000 volumes, there are especially rich holdings of the publications of such important printers and publishers such as Gabriele Giolito de’ Ferrari of Venice, members of the Giunta family of Venice and Florence, Lorenzo Torrentino of Florence, and Alessandro Paganino of Toscolano. Current collecting interests for this collection include 16th-century Italian illustrated books, architecture books and guidebooks of Rome, pilgrimage guides, and texts in various Italian dialects, such as those of Venice, Florence, Padua, and Tuscany. The Early Italian Printing Collections preserves more than 400 incunables or books printed during the infancy of printing, before 1501. Eighteen are Aldine incunables; more than twenty were produced by Nicolas Jenson and ten or more each by Johann von Köln and Johann Manthen, Cristoforo de' Pensi, and Erhard Ratdolt, to name just a few printers. Like the Aldine collection, the Early Italian Printing collection offers the researcher many examples of historical bindings, different types of book illustration and book decoration such as gauffering and fore-edge painting, press practices typical of the period, typography, annotations, and provenance evidence such as bookplates, ownership stamps and inscriptions, monograms, and personalized bindings. Readers should search the online catalog. Records for items in the Early Italian Printing collection include the code EIP which can be used in keyword searches for more precise retrieval. Items in this collection have call numbers beginning with Z233.I8, and a list of these titles, arranged by author, can be retrieved with a call number search of this prefix. Incunables have call numbers beginning with A1. Enter special call number prefixes in a call number search to retrieve books printed by members of the Giunta family in Venice (Z233.G44), in Florence (Z233.G45) and by Gabriele Giolito de’ Ferrari (Z233.G4). An excellent online resource for 16th-century Italian imprints is EDIT 16, the online version of the union catalog Le edizioni italiane del XVI secolo: censimento nazionale, very helpful for its accurate descriptions, biographical information, digital images of title-pages and colophons, and list of holding libraries in Italy. Traditional print resources include Short-title catalogue of books printed in Italy and of Italian books printed in other countries from 1465 to 1600 now in the British Museum (London, 1958); and the 2-volume Catalogue of books printed on the continent of Europe, 1501-1600 in Cambridge libraries. Consult the multi-volume Catalogue of books printed in the XVth century now in the British Museum for detailed bibliographic description of incunables, and extensive information on early printers.